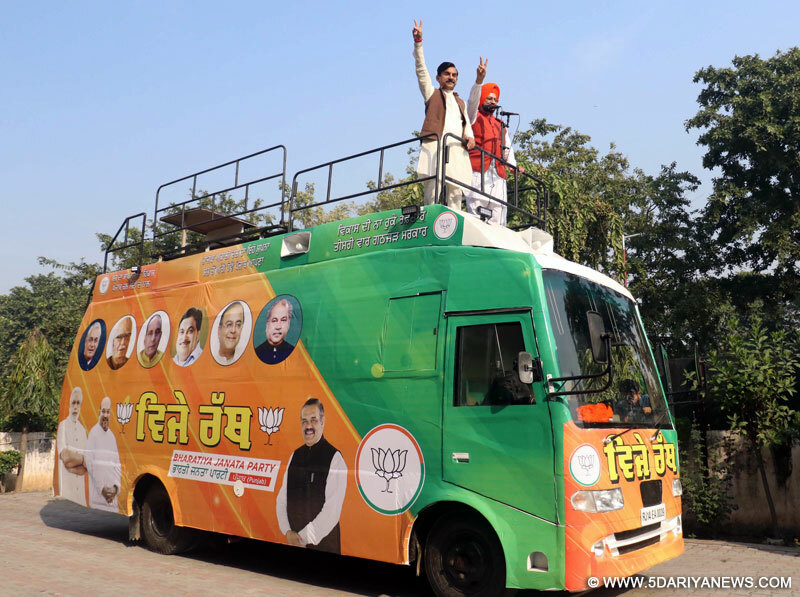 The Punjab unit of the Bhartiya Janata Party is all set to kick-start its poll campaign for the state assembly elections tomorrow (December 29) with state party chief Vijay Sampla launching a Vijay Sankalp Rath Yatra from Hussainiwala. The 8-day long Yatra will traverse all the 23 assembly constituencies where the party fields its candidates and will culminate in Amritsar on January 8. Addressing media persons at the party headquarters here today, state party secretary, Vineet Joshi showcased the Rath (chariot) specially designed for the purpose and announced details of the Yatra.Giving out details, Joshi said, “The Vijay Sankalp Yatra will start from Hussainiwala tomorrow after paying tributes at the Shaheed Smarak (Martyr’s Memorial). It will cover all the assembly constituencies where the party fields its candidates and will end in Amritsar on January 8. On the first day of the Yatra the Rath will start from Hussainwala and travel through cities and villages of Ferozepur and Fazilka and will reach Rajpura on December 30”. “The second phase of the Yatra will be undertaken from January 3 from Shri Anandpur Sahib and the Rath will travel to Phagwara. On January 4, the Rath will pass through Ludhiana (Central), Ludhiana (North) and Ludhiana (East) constituencies, while on January 5, the Yatra will reach Hoshiarpur, Dasua and Mukerian. On January 6, the Yatra will traverse via Pathankot, Sujanpur and will enter Bhoga. On January 7, Dinanagar, Jalandhar (Central), Jalandhar (North) and Jalandhar (East) constituencies would be covered. On the final day, i.e. January 8, the Yatra, after showing up in Amritsar (Central), Amritsar (East), Amritsar (West) and Amritsar (North), will culminate in Amritsar where Union Finance Minister Arun Jaitley will address a huge public rally”, said Joshi.Presenting the party’s hi-tech Rath before the media, Joshi said that it would allow the party to connect more with the masses. “Equipped with modern, state-of-the-art facilities, the Rath is actually a stage from which state party president, Vijay Sampla and other senior party leaders will address the public. We will be having 4-5 stopovers at different places like ‘chowks’ and ‘nukkars’ within each city and interact with the people. We will tell them about policies of Union and State governments and get their feedback. The Rath is equipped with a hydraulic system that allows the roof to open as and when needed and provides a podium. The vehicle is fitted with LED TVs, Laptops, printers etc. to monitor news and execute IT activities. Also, an ultra-modern light and sound system has been fixed so that the leaders can address people at any time of the day. The Rath has a meeting and resting space for five to six people on board and also an attached toilet. Another Rath will also accompany the Yatra which would be used by the Social media cell”, he said.